Golden brown, savoury mushrooms piled on crusty, garlicky bread make these Mushrooms On Toast recipes perfect for an appetizer, lunch or snack. So filling and delicious! Hey friends, hope all is well with you! 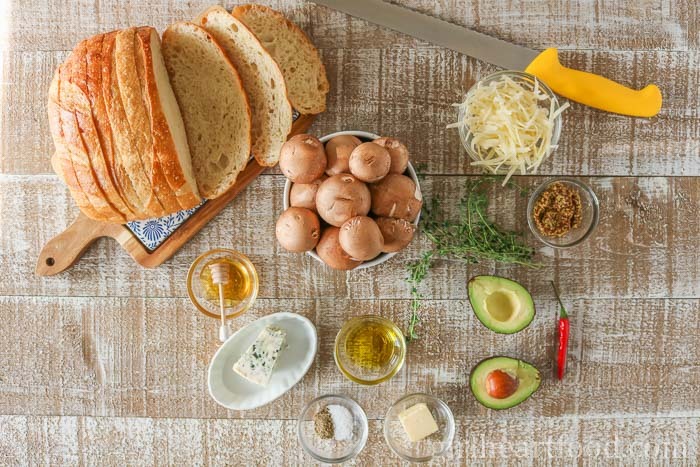 Today I’m sharing a super simple recipe with OPTIONS – mushrooms on toast made 3 ways! Because ya know we have GOT to have options! Though, with me, when given too many options I get a little indecisive. My hubby can attest to that. Twist my rubber arm, lol. This recipe is beyond simple and requires basically a couple of things – cook mushrooms and toast bread (and assemble, of course). Girl can’t toast bread if her life depended on it. Ok, that may be a tad dramatic, but seriously. You know that commercial from years ago with the small kitchen appliance…something like ‘set it and forget it’?. Well, clearly, you don’t do that for toast. What Goes in this Mushrooms on Toast Recipe? But, like mentioned, I took things a little further and am sharing not one, but three, delicious variations for this mushrooms on toast recipe. What Type of Mushrooms Should I Use? What are Cremini Mushrooms? For this recipe, I opted to use cremini mushrooms, otherwise known as ‘baby bella’ or ‘baby portobello’. They’re just a cross between white button and portobello. The Kitchn explains it here. 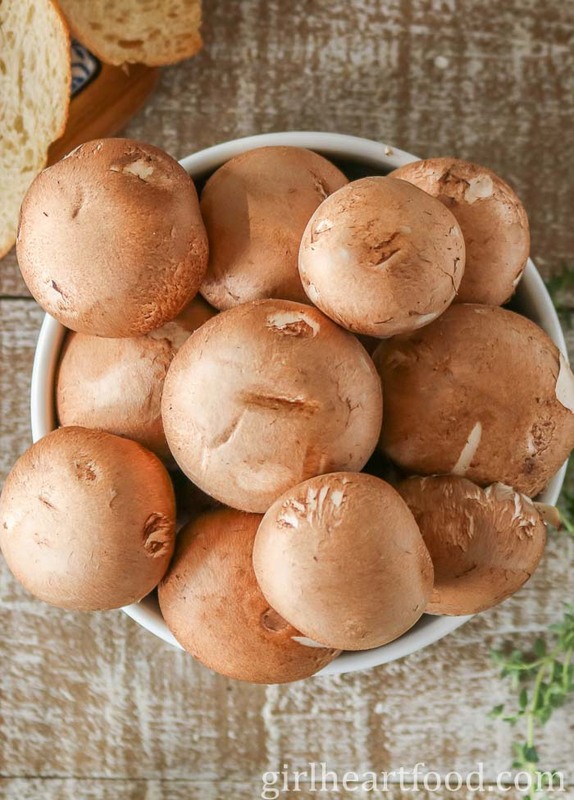 Cremini mushrooms are readily available in grocery stores, pretty budget friendly and taste delicious. If you want to go ahead and use white button, though, go right for it! There’s always this debate on how to clean mushrooms. Do you gently wipe with a dampened paper towel, removing any debris, or rinse under water? For this recipe, however, and to obtain maximum ‘golden browneyness’ (is that even a word??) I simply dampened a paper towel and removed any debris or dirt. Best Way to Cook Mushrooms? When oil is shimmering and ready to go, add half of mushrooms. Spread out in pan so there’s a little bit of space between ’em. Don’t touch them for about 5 minutes. After 5 minutes, stir and cook an additional 4-5 minutes or until you’ve released most of the moisture and they’re golden brown. 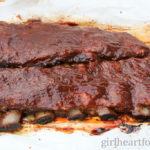 I still like a little moisture in mine, but if you like less cook a little longer. Repeat with remaining oil and mushrooms. 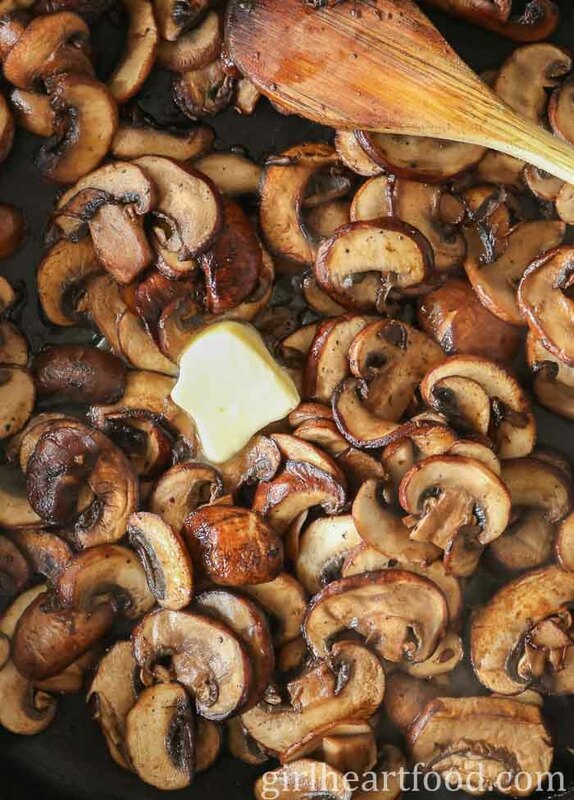 Once mushrooms are good to go, add all of them back to pan, throw in a dab-o-butter, salt and pepper and stir to combine. Ready to be devoured on toast! When Should I Season Mushrooms? Seasoning of the mushrooms comes at the end when they’ve released some of their water. If you season too early, they will take longer to properly brown. Can I Add More Flavour to the Mushrooms? If you like, you could stir in some minced garlic during the last minute or two of cook time. However, what I did for these mushrooms on toast recipes is rub garlic on the actual toast instead. A little garlic goes a long way here so unless you’re a huge garlic fan like me (or trying to ward off vampires or something), rub gently. 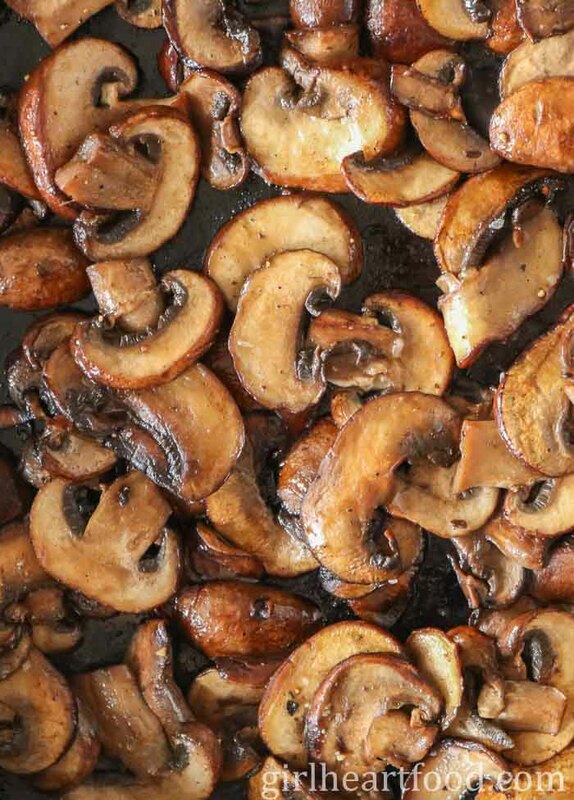 This recipe uses 1 lb of mushrooms and yields about 8 mushrooms on toast portions. Reduce if you want less. Speaking of portion sizes, the quantity you yield may vary depending on the size of your bread slices. I used sour dough and they were generous sandwich-sized slices. Leftover mushrooms? Use ’em the next day in an omelette! There is no ‘set in stone’ quantities for the toppings you use here. The amount will vary depending on the size of bread and what you like. Enjoy blue cheese A LOT? Use what you like. Like things sweet? Add extra honey. Nothing complicated here. Build your mushroom toasts how you like it! If you want things a little more lush try creamy mushrooms on toast! Stir in about 1/2 – 1 tablespoon of crème fraîche at the end of cook time. 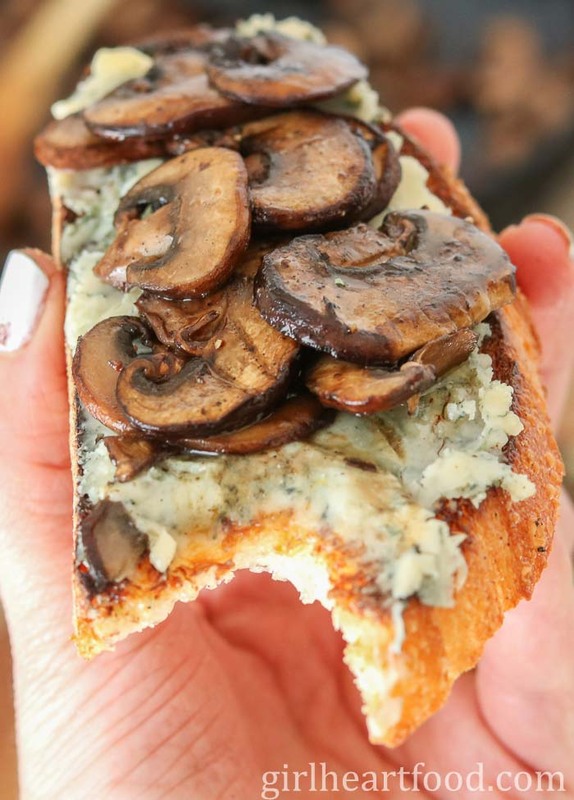 Hope you love these easy mushrooms on toast recipes! Which one would you pick? In a large cast iron pan on medium heat add half of olive oil (1.5 tsp) and half of mushrooms (work in batches so pan is not overcrowded). Cook 5 minutes, undisturbed. Stir and cook another 3-5 minutes. Remove mushrooms from pan and continue with second batch with remaining olive oil and mushrooms. Add all mushrooms back to pan, stir in butter and a pinch of salt and pepper. 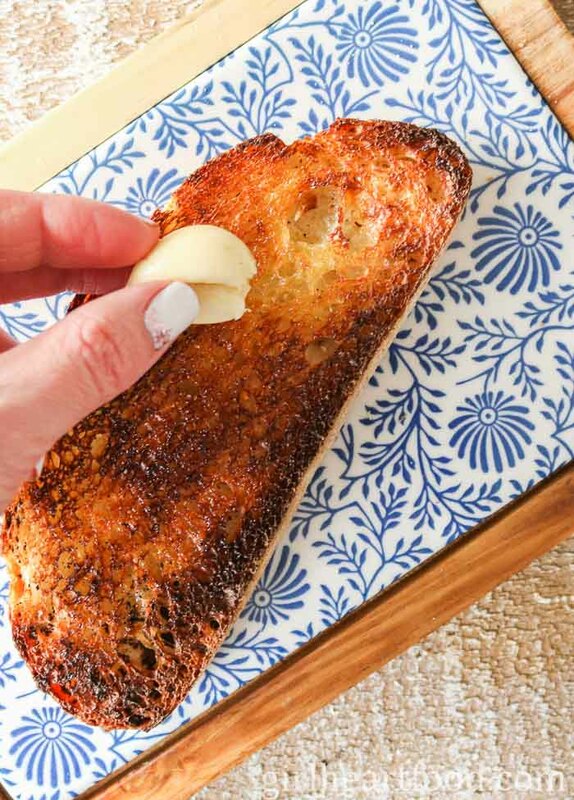 Toast bread and (gently) rub with a clove of peeled garlic. Mash avocado and pile on toast. Note: add a tablespoon or so of lemon juice if you like here. Also, if you prefer to simply slice the avocado instead, that's a-ok too. Top with cooked mushrooms and chili. Enjoy! Spread with blue cheese. Top with cooked mushrooms and drizzle with honey. Enjoy! Spread mustard over bread. Top with cheese. Broil in oven for a minute or just until cheese is melted. Top with cooked mushrooms and fresh thyme leaves. Enjoy! The ingredient list above for the mushroom component is for approximately 8 toasts, while the combination components are for 1 toast. You may want to make just one variety or all 3 and I find it's easier to follow as listed above. Leftover mushrooms? Use 'em the next day in an omelette! There is no 'set in stone' quantities for the toppings you use here. The amount will vary depending on the size of bread and what you like. Enjoy blue cheese A LOT? Use what you like. Like things sweet? Add extra honey. Nothing complicated here. Build your mushroom toasts how you like it! If you want things a little more lush try creamy mushrooms on toast! Stir in about 1/2 - 1 tablespoon of crème fraîche at the end of cook time. So simple but so awesome! Two of my very fave things- toast and mushrooms, yet I never thought to eat them together. Sooo making this! 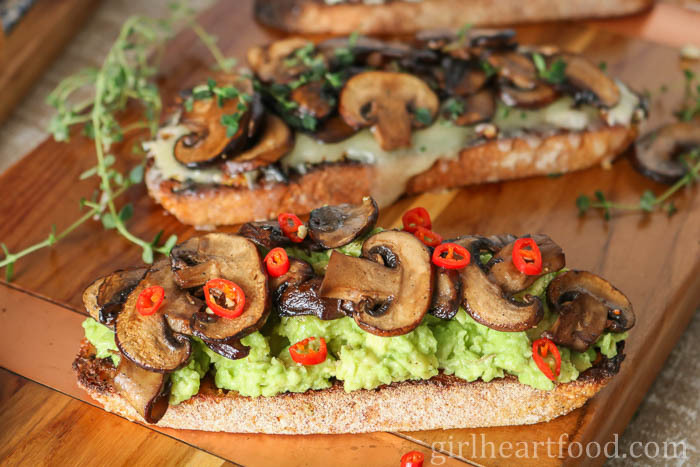 Love mushrooms on toast, such a great appetizer or anytime snack. Love the 3 different flavour profiles you did here. Savoury mushrooms are so appealing and you have done them justice with your variations of mushroom toast, Dawn! They all look so yummy to me – I think the Cheddar, mustard and thyme variation would be my favourite, but I’ll bet the other variations are just as wonderful. And, on sourdough – perfection! Thanks so much for sharing. How have I never had mushrooms on toast before? These all look and sound amazing! I usually like to look at recipes and put my own spin on them, but I think I might just have to copy these exactly. Especially that cheddar and thyme one, MY GAWD. I can literally live on bread, brushetta, and crostini especially in summer (But I try not to! ), so I can easily manage all 3 versions. But my favourite would be with blue cheese – perfect! Lol! Year round for me 😉 Thanks Ben! Hope you’re having a great weekend! Haha – Dawn, I went through a phase when my toast was either burned or not done enough… so totally understand! 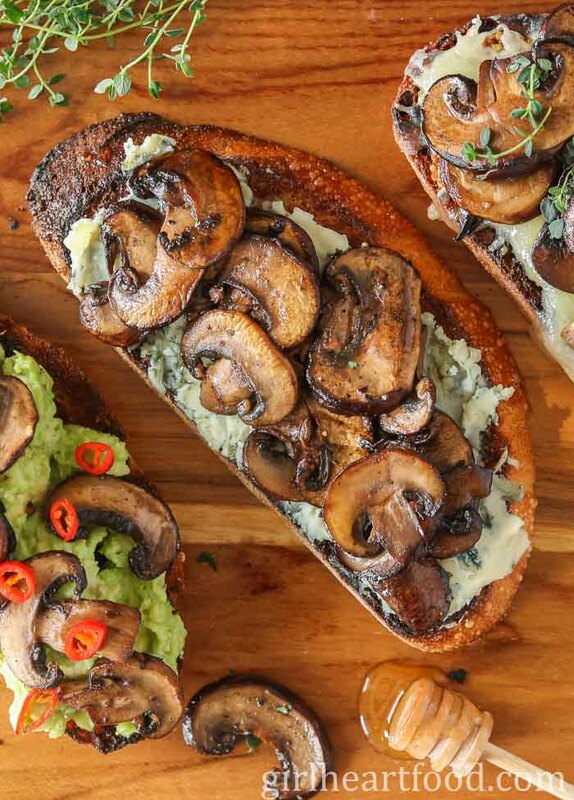 BTW – this time your toast looks fabu, piled high with those delicious looking mushrooms! I love mushrooms and this is calling my name! Lol! Glad I’m not the only one 😉 Thanks Shashi!! Thanks Valentina! You’re so kind 🙂 !! OMG blue cheese and honey, yes please! Love that one too! Thanks Jo! Dawn – I love anything with mushrooms and certainly a mushroom-centric dish like this is so so tempting! These are lovely, and I love “well-toasted” bread myself, so Perfect! I’m all in for each of these toasts! This is one dish that is just satisfying looking at the photos but I know even better as the real deal! Love all the variety and options to pair these mushrooms with on a crispy, crunchy piece of toast! I love this! It reminds me of a Polish street food that is very famous in Krakow, called zapiekanka. Toasted bread with cheese and mushroom in the basic version, you can find as many varieties as there are ingredients you can add to them. Mushrooms are just chopped fresh and baked on the bread, like on pizza, but even on pizza I like them better when they’re sauteed in butter. Oh, so nice! Well, anyway, zapiekanza has a different bread, too. Look it up, it’s delicious. So smart about how washing them under water will add more moisture – why haven’t I ever thought of that?! Ugh, those little golden brown nuggets look like perfection! I think I would have to choose that whole grain mustard, and cheddar mushroom toast with the thyme. Looks perfect! Happy Monday, Dawn! Good choice, Haylie 🙂 Thanks so very much and have a great week too! 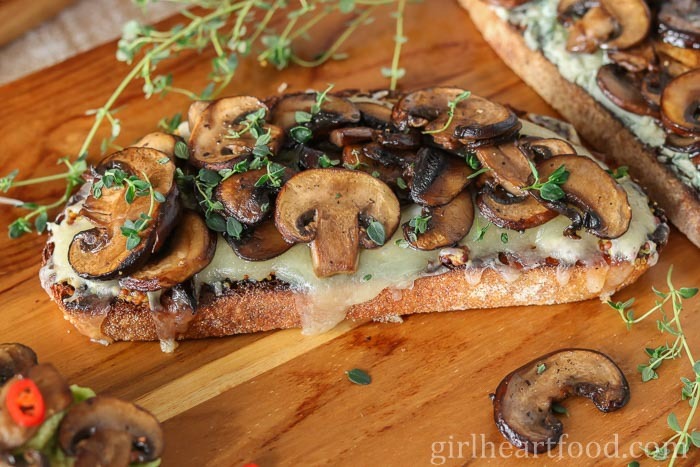 What a fun idea to use sauteed mushrooms as a topper for toast! That blue cheese + honey version is totally calling my name. Talk about some strong (but awesome!) flavors! I have totally scorched bread myself, too. I like to slice baguettes in half and toss ’em on the grill during the summer…but you have to watch those closely! I won’t say how many times I’ve turned a baguette into a charred mess. Haha! Love these recipes, Dawn! What can I say – I love mushrooms!!! Your ‘set it and forget it’ made me laugh. I’m the opposite – Etienne complains that I don’t toast the bread ENOUGH. He’d probably be happy with your burned version, haha! I love how easy this is – such a great idea!! Have a great week Dawn! Haha…so true though 😉 Thanks Katherine…have a great week too! Sounds like when I make grilled cheese Dawn! I ALWAYS burn it! I used to serve it to my boys, burnt side down when they were little. Lol! They caught on quick! I love all three options you’ve got going here. Mushrooms are our favorite too. Definitely trying! Pinned! Lol! Happy to hear I’m not the only one 😉 Thanks Mary Ann! Hope you love them! Those mushrooms could just be eaten all by themselves! But I’m certain they’d be even more delicious on these different types of toast. I think I’ll try the avocado version first! Mushroom avocado toast has been my obsession lately but I think your blue cheese version might beat that. OMG I can’t get enough blue cheese and I HAVE to try it with mushrooms :). LOVE all three of these! Have a great week, Dawn! Dawn, it’s funny you say that you have trouble with toast. As drop dead gorgeous as those mushrooms are, my eye kept going to the edge of the toast. Girl sure knows how to toast some bread! Yum! 🙂 These mushroom toasts look fabulous. I’m going to have to try them all! Have a great weekend! Awww, you’re so sweet! Thanks Kelly!! Hope you love them as much as we do 🙂 Have a great week!